Carrier has compiled a list of industry terms and phrases that are often used when referring to vibrating, processing, recycling and foundry equipment. Most of these phrases refer to dynamic balancing, vibration isolation and vibrating equipment spring systems. Our customer sales representatives, support team and engineers are more than happy to assist you to determine your needs and explain any of our terminology in more detail. Base Mounted – Conveyor base mounts to floor or a support designed to absorb vibrations. Recommended for installation at or below grade. Isolated Weighted-Base Balancing – Conveyor base with several times the mass weight of pan is mounted on isolation springs. Depending on spring type, isolation percentage can be as high as 80 to 90 percent. 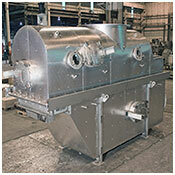 Balanced – Counterbalance member operates 180 degrees out-of-phase with conveyor pan. Identical spring systems create equal and opposite forces to reduce reactions by at least 90 percent. Base-Excited Balancing and Isolation – Counterbalance member under conveyor pan with spring connection to pan. Reduces reactions by at least 95 percent. 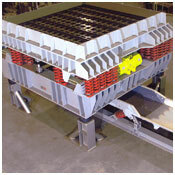 Isolated-Balanced – Balanced type conveyor with base mounted on isolation springs. Combination reduces reactions by at least 98 percent. Coil Springs/Rocker Arm Stabilizers – For heavy impact and transverse loads. This combined assembly of chrome manganese steel coil springs and rugged cast rocker arm stabilizers provides durability for maximum longevity in operation and low maintenance. 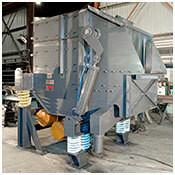 Rubber Shear Springs/Rocker Arm Stabilizers – Designed for high impact loading and medium to heavy-duty applications. This design is impervious to water and other contaminants. Coil Springs/Leaf Spring Stabilizers – Rugged, heavy duty construction for high-capacity application. This construction is excellent for high temperature use.